For BestGene Drosophila Genome Editing Service, pls see here. For currently available Cas9 stocks at BestGene, pls see here. 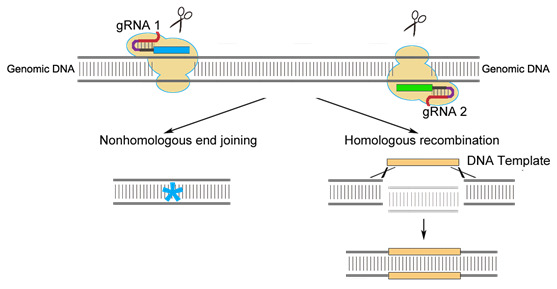 CRISPR/Cas9, TALEN, ZFN system are three powerful genome engineering tools that are composed of programmable, sequence-specific DNA-binding modules associated with a nonspecific DNA nuclease, which introduce DSB (DNA double-strand breaks) that stimulate NHEJ (non-homologous end joining) or HR (homologous recombination) repairing mechanisms at specific genomic locations. In the application of these technology in Drosophila, random indels can be introduced into DSB via NHEJ. Currently, CRISPR/Cas9 has grown in popularity for Drosophila genome editing. CRISPR/Cas system (clustered regularly interspaced palindromic repeats/CRISPR associated) is a component of bacteria/archaea innate immunity system. Type II CRISPR/Cas9 system uses ~20 nt sequence of crRNA to bind its complementary sequence of exogenous DNA. Subsequently with the aid of trans-acting RNA (trancrRNA), Cas9 endonuclease is recruited to the sequence and cut off the DNA at both strands. 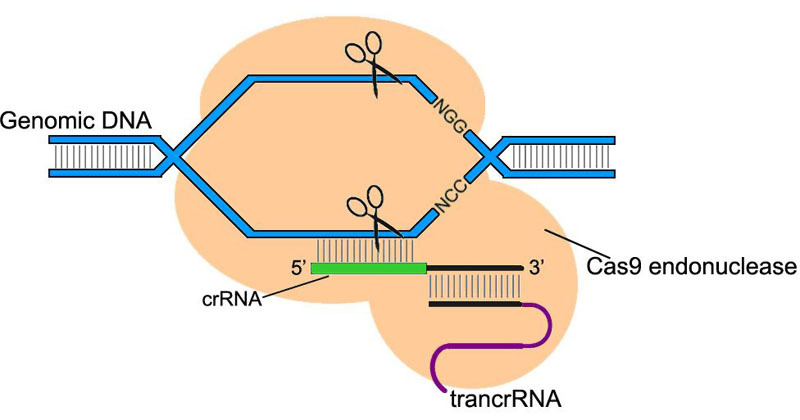 In the application of CRISPR/Cas9 system in Drosophila genome editing, the two RNAs that play key roles can be synthesized into a single chimeric RNA (chiRNA or gRNA). By editing the 20 nt targeting sequence of gRNA, the system introduces DSB on the target sequence followed by an NGG or NAG protospacer adjacent motif (PAM) required for Cas9 cleavage. Since CRISPR/Cas9 works through RNA-DNA recognition, Cas9 can perform its function simultaneously with multiple gRNA target sites, thus facilitates precise deletion, insertion and sequence replacement between the space via HR repair mechanism. For selecting/designing CRISPR target, DRSC Find CRISPR Tool is a genome-wide resource based on D. melanogaster genome assembly 6, and CRISPR Efficiency Predictor reports predicted efficiency based on nucleotide sequence. Considering polymorphisms between a chosen fly strain and the reference genome, flyCRISPR Optimal Target Finder identifies gRNA target sites in user-supplied DNA sequence, evaluated with the reference of genome sequences, including D. melanogaster release 6, D. melanogaster vas-Cas9(III) (BDSC#51324) whole-genome sequence and other Drosophila genomes, etc. Currently available Drosophila Genome Editing Stocks at BestGene Inc.
*We only accept Plan RH or Plan RI orders for the Cas9 stocks on the table. For creating stable attP-gRNA-expressing lines, you may actually choose any of the vermillion+ based attP lines from these lists. We may setup the crosses to the y-v- line and screen for v+. You may get the same v+ G2 transformants as using the v- based attP lines. This is just regular Plan H or Plan I with extra v+ screening. You may also ask us to keep the resulting gRNA lines and have us cross to any of the Cas9 stocks and inject their F1s (additional Plan R) later. Copyright © 2004 - 2019 BestGene Inc. All rights reserved.